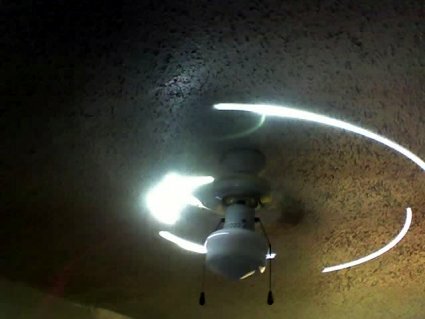 I noticed how boring my ceiling fan was just a few minutes ago. So I decided to do a small modification to it to make it a little more interesting. I had 60 extra LEDs sitting around (excess from my LED Projector project), so I took 4 of those, a cell phone battery, 4 resistors, some wire and ductape (most important of them all). I had run out of solder, so all the connections were made horribly by twisting the wires. Ductape everything on the fan wings, put the battery as close to the axis of rotation of the fan as possible (since you don’t want the fan moving around because of balance issues). An interesting side effect of my sloppy twist wire connections was that the vibrations of the fan actually connects/disconnects the circuit at a really high frequency, giving it a strobe light effect. To the naked eye, it looks like hundreds of little light segments rather than one line (as the images display). 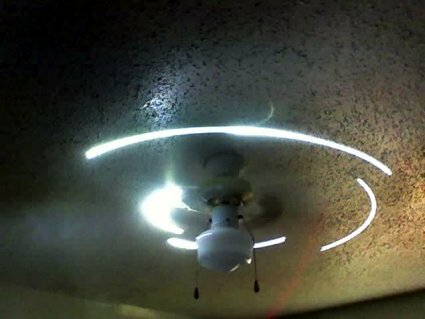 Overall I think this is something anyone can do if they have a boring ceiling fan and 10 minutes to kill.